Lightest on the market at just 8.5kg! With the arrival of GenPower and Baumr-AG Petrol Generators from Edisons, you need not worry anymore about unexpected power cuts or bad power supply at home or in your business. Compared to diesel counterparts, they are generally a quieter option and have a lower operating cost. Unlike cheaper brands, these units are easy to maintain and promise to deliver optimum performance for a very long time. Ideal for infrequent or temporary use, GenPower and Baumr-AG Petrol Generators are generally less expensive without compromising power. They are less harmful to the environment, thus making them a safer and smarter choice for those who are looking for a dependable backup power option for their homes. They are also ideal for maritime use particularly for boat types such as larger cruisers and towing sports. 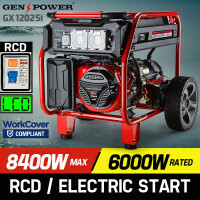 GenPower and Baumr-AG Petrol Generators have class-leading power from their engines and alternators. The massive tank capacity guarantees continuous use, while the exclusive digital control ensures stable voltage supply. The tough and clever designs make them ideal for site work events as well as farming applications. With their carefully designed features, you will surely enjoy the convenience of having uninterrupted power supply anytime, anywhere. The easy access filters make maintenance a breeze, while the fail-safe engine protection is the first defense against overloading, low oil and high temperature. 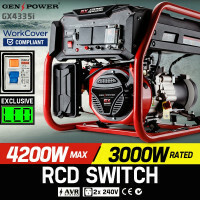 The convenient starting guide comes in handy, while the RCD safety switch ensures that these units comply with the Australian construction standard for site usage. Other things to love are the longer running time, external earth point for added safety and rubber engine suspension system depending on the model. In addition to petrol generators, Edisons also offer an extensive selection of top quality Diesel Generators. We also sell power converters and other key accessories such as Transformers, Inverters and Power Cords. Also available are Petrol Stationary Engines and Diesel Stationary Engines for your different needs. 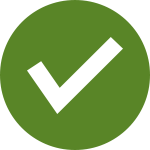 Save time and money by making the smarter choice. 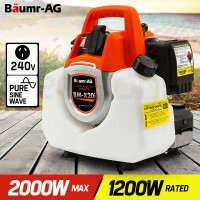 Order a GenPower and Baumr-AG Petrol Generator today!